Boat Navigation by Dead Reckoning. 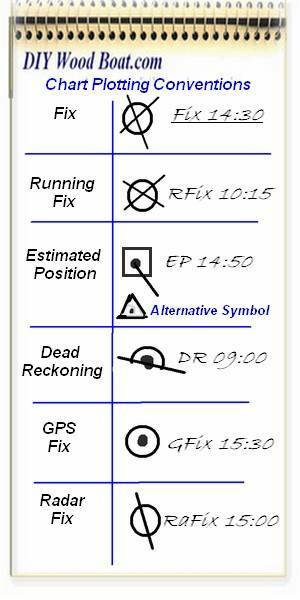 DR, Dead Reckoning is one of the most basic and useful Navigational skills. Learning and practicing the basic forms of navigation such as this will improve your navigational skills regardless of what aids, such as GPS you use. It is untrue to suggest that traditional methods of dead reckoning are no longer used as that is precisely what most modern inertial navigation systems depend upon, except that they do it electronically. However, plotting your DR the old fashioned way is a very simple system which, does not rely on any electronics or outside input. With it you can quickly determine your present position by plotting the course and speed from a previously known position. It can also be used to determine your future position by projecting the present course and speed from your present position. DR positions should be plotted at regular intervals depending on the nature of the passage. They should be updated between fixes and changes in course or speed. Of course it's important to remember that any direct reckoning position, whether done electronically or manually is only an approximation as it does not factor in tidal effects or leeway. But by plotting the DR manually, as well as fixing your position with GPS, you will have a far better feel for where you are and how you are progressing. Marine Chart Line Plotting In my opinion your DR plots should be drawn directly on to the relevant chart. Some folk use 'chart paper' rather than writing directly onto their chart, personally I feel that this is too prone to error and anyway it is easy to erase pencil lines provided you don't score them too heavily. The first job is to draw your 'rhumb line'. This is the preferred course from you starting position towards your destination. The starting point should be a fix such as the harbor entrance or a channel marker which is shown on the chart. Having drawn this you will now be aware of any possible hazards along the route and the course required to avoid them. It will also allow you to work out the time when you need to change course to avoid them. How often you need to DR along your rhumb line will depend on where you are. The closer to the coast and the more hazards there are, the more often you should DR and compare with the GPS information and if coastal sailing, any fixes taken from known conspicuous marks. Running the DR along a rhumb line will quickly allow you to see if you are drifting off course. Marine Chart Plotting Symbols Traditionally a 'dead reckoning' plot does not take into account the effect of currents or wind. A position which is determined by factoring in the estimated effects of wind and tide is regarded as estimated position, EP. The dead reckoning begins with a known position, or fix. The line is then drawn on the chart along the boats bearing. The distance of the DR position along the line is marked by multiplying the speed through the water by the time to the mark. The plotting of a DR is normally separated by either time intervals or where a fix can be made. Where a position fix is unavailable the new dead reckoning plot should start from an estimated position EP. This should be worked out by taking into account the effects of wind, tide and leeway; estimated set and drift. It is important to mark the positions times distances etc clearly using the recognised conventions so there is no confusion and they can be easily read later. For consistency, and by convention, use only True directions on the chart. 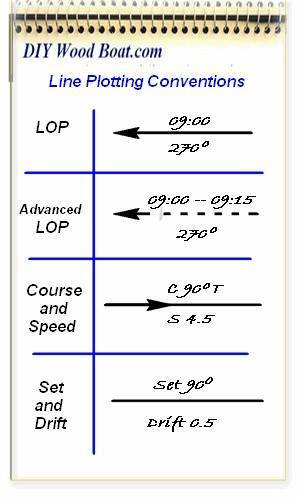 Use the latitude scales on the sides of the chart for distances in nautical miles (one minute of latitude equals one nautical mile). Record the time using the 24 hour clock. Boat speed must be the speed through the water, that's the speed taken from the knot meter not the Speed Over Ground (SOG) as taken from the GPS. All Dead Reckoning calculations are fairly simple provided you use the correct units of measurement. Speed is the through the water in knots. Distance is measured in nautical miles. And time is measured in minutes. And course should always be noted using the same preference whether in degrees True or Magnetic. I prefer to use Magnetic but I always mark it as such so there is no confusion. The further you extend a DR from a Fix the greater will be the 'Circle of Error'. While factoring in Set and Drift will reduce the size of the Circle of Error, it should still be taken into consideration. However, the more you practice your Dead Reckoning techniques the sooner it will become second nature and you will not only gain confidence in your navigational ability but you will learn to compensate for the errors.